Did you know it was the mere speaking of the word of God that HIS Spirit began all creation? (Genesis 1:1-5). In the beginning God created the heaven and the earth. And the earth was without form, and void; and darkness was upon the face of the deep. And the Spirit of God moved upon the face of the waters. And God said, Let there be light: and there was light. And God saw the light, that it was good: and God divided the light from the darkness. And God called the light Day, and the darkness he called Night. And the evening and the morning were the first day. 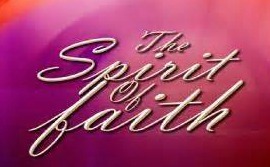 As Christians we too by faith of the same Spirit can call into being things that are not as though they were. Abraham had this kind of faith and many others after him including us, for we know without faith it is impossible to please God. (Hebrews 11:6)….. (Romans 4:16-18). God is always at work in the life of the Believer, and many times we encounter HIS people (Ministering Angels) yet some are not aware that they have entertained angels! Faith on behalf of the believer in Christ can bring heaven down to earth. (Hebrews 13:1-2) Let brotherly love continue. Be not forgetful to entertain strangers: for thereby some have entertained angels unawares…….. (Matthew 6:10). The flesh is weak and at times the strength that is needed is by the Spirit of God Himself that will carry us through the most difficult of situations. Faith moves mountains in our life! When we read in the Lord’s Prayer lead us not into temptation, but deliver us from evil we can be sure that HE is faithful to keep us away from evil. (2 Thessalonians 3:1-3). Finally, brethren, pray for us, that the word of the Lord may have free course, and be glorified, even as it is with you: And that we may be delivered from unreasonable and wicked men: for all men have not faith. But the Lord is faithful, who shall stablish you, and keep you from evil.